You can use Nautilus to view available Samba shares on your network. Select Places (on the Panel) => Network Servers to view a list of Samba workgroups on your network. You can also type smb: in the File => Open Location bar of Nautilus to view the workgroups. 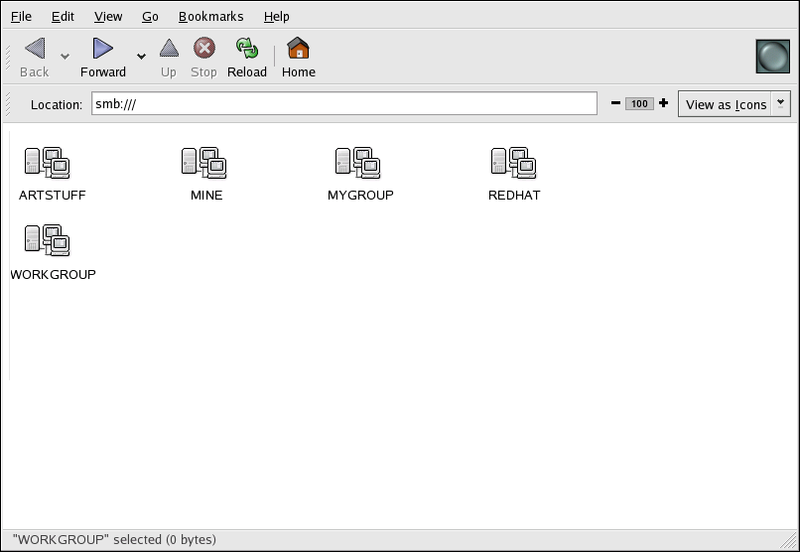 As shown in Figure 19.1, “SMB Workgroups in Nautilus”, an icon appears for each available SMB workgroup on the network. Double-click one of the workgroup icons to view a list of computers within the workgroup. As you can see from Figure 19.2, “SMB Machines in Nautilus”, there is an icon for each machine within the workgroup. Double-click on an icon to view the Samba shares on the machine. If a username and password combination is required, you are prompted for them. To query the network for Samba servers, use the findsmb command. For each server found, it displays its IP address, NetBIOS name, workgroup name, operating system, and SMB server version. Replace <hostname> with the hostname or IP address of the Samba server you want to connect to, <sharename> with the name of the shared directory you want to browse, and <username> with the Samba username for the system. Enter the correct password or press Enter if no password is required for the user. If you see the smb:\> prompt, you have successfully logged in. Once you are logged in, type help for a list of commands. If you wish to browse the contents of your home directory, replace sharename with your username. If the -U switch is not used, the username of the current user is passed to the Samba server. This command mounts <sharename> from <servername> in the local directory /mnt/point/. For more information about mounting a samba share, refer to man mount.cifs.